The American Water Spaniel was developed in the Fox and Wolf River valleys of Wisconsin during the mid-1800s. Reliable breeding records date to 1865. The AWS's ancestors probably include the Irish Water Spaniel, Curly-Coated Retriever, Field Spaniel, and the now-extinct Old English Water Spaniel. Whatever his family background, the AWS we know today was bred to be a versatile hunting buddy. His dense, curly coat helps protect this natural swimmer from cold water as well as from briars in the woods; his small size allows waterfowl hunters to take him in a little boat or canoe; and he will tenderly retrieve grouse, quail, pheasant, and ducks. The AWS sticks close to his human hunting companion rather than ranging far afield. Hunters along the Mississippi flyway and its northern tributaries often used the versatile AWS, taking advantage of the dog's ability to work in varied terrain from marshes to uplands, his endurance, and his ability to retrieve many birds in a day. But when larger retriever breeds from England became popular, the little brown spaniel began to fall out of favor. Fortunately, he had a fan in Doctor F. J. Pfeifer of New London, Wisconsin, who's credited with saving the breed from extinction. Pfeifer bred and sold American Water Spaniels, formed a breed club, and helped to develop a breed standard - a written description of how the AWS should look. His efforts paved the way for the United Kennel Club's recognition of the breed in 1920, the Field Stud Book in 1938, and the American Kennel Club's recognition of the breed in 1940. 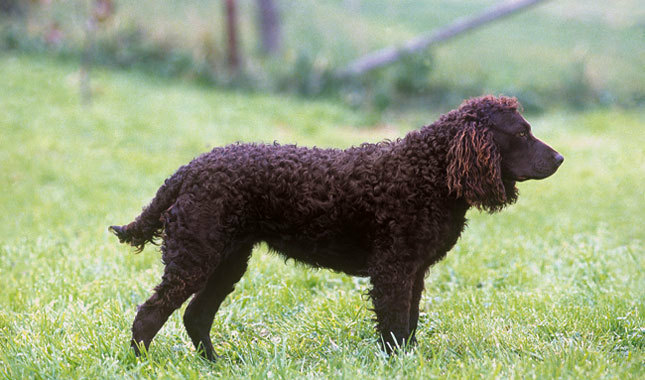 One of Pfeifer's own dogs, "Curly Pfeifer", was the first registered American Water Spaniel. The American Water Spaniel remains rare, with fewer than 3,000 in existence today. This rarity has probably saved the breed from splitting into two groups, one used for dog show competitions, and the other to continue the breed's traditional job as hunting companion, as seen in some other retriever breeds. He was named the state dog of Wisconsin in 1986.